As you may have noticed from my previous blog posting, we will be returning to the U.S. following our 2 year language and culture studies in China. In fact, our departure date is today! While it would be foolish to believe I can anticipate exactly how reverse culture-shock will impact me, there are several things I “think” will be true. Here’s my best estimate for a Top 10 List of what I think I will miss and what I will enjoy about returning to the US after 2 years in SW China. Obviously, I will miss the many special friends and relationships we have developed over the past 2 years. This will be the hardest part of transitioning back to the US, and I am omitting this most important category to keep this article light and enjoyable (at least for me!). Riding motorcycle in the crazy local traffic! My favorite “egg lady” – How can buying eggs be so much fun?! My last bowl of hand-made noodles…couldn’t resist! Ability to communicate with majority of society! US “standard” height countertops, tables, chairs…even vehicles! Fewer fish bones and bone shards in meat! I’m sure there will be plenty of surprises during the coming months (and even years) as we experience life in our previous culture, but one that is no longer our only culture. So, I hope to share some of those surprises in this blog with those who might be interested. Ever wonder what life is like in a remote Chinese village? We had the privilege of visiting a village in the mountains last week. It was just a few days before the Chinese New Year and the day when most families in the village kill a pig in preparation for the new year. Our host (George) is from this village and we were invited (along with several other friends) to share the annual event and meal with him and his family. Friendly Yi lady who seemed happy to visit with us during our walk. George comes from the Yi (pronounced “Yee”) people. The Yi are one of China’s ethnic minorities with their own culture and language. Getting to his village requires driving up a steep mountain road (with no guard rails) to the very top of the mountain where his village is located. Even after driving our own mountain road in Colorado hundreds of times, I must admit I found the occasional 1,000 ft + exposure a bit uncomfortable! This village has about 2,000 residents. Life here is very simple, and with the exception of electricity, smart phones, TV’s and several cars, life here does not appear to have changed much during the last hundred years. Village “patron board” recording family donations of as little as 15 Yuan (Approx. $2 USD). After tasting some raw pork from the freshly killed pig (a local delicacy), we went out for a walk through town where we saw many other pigs being killed, burned and prepared for the special meal. Our Buddhist friend, Jupiter, was not thrilled about all this animal killing, but he was a real trooper and never once complained – probably because he knew what he was signing up for in advance! Face from George’s family’s freshly killed pig (note the missing slices from the snout…a favorite delicacy for a special “raw” snack). “Raw” slices of just-burned pig skin, complete with dipping sauce…yes, I had some! Another village pig being burned to remove the hair before butchering/eating. Historically, this annual event provided the only pig to be eaten by the family for an entire year, making this celebration extremely significant, including elements of ancestor worship that are still practiced to this day. Today’s increased affluence means that there should be plenty of meat throughout the year, so some of the freshly butchered pork is now shared with friends and family, while the rest of the meat is salted and dried for future use. George’s family home and courtyard, site of his pig burning, butchering and lunch! During our walk around town, we strolled through blossoming plum and pear orchards, for which this particular village is well known. These orchards provide the local villagers with a mechanism for generating revenue to purchase items beyond their immediate needs. Mules are an important part of this community as they are needed to haul the fruit from the orchards to the village roads for transporting down the mountain to local markets. Because the orchards are grown on mountain terraces, mules are much more practical than motorized vehicles for getting through narrow trails and gates to the source of the fruit. Our friend, Jupiter (from Beijing) and his new friend, George’s mule! Superstition and legend are still alive and well in this village. While touring the village, George told us the story of his great grandfather (by marriage of an uncle). His ancestor was a famous bandit and village leader. Apparently, he was a bit of a “Robin Hood” and his legend is kept alive by his descendants who provide tours of his original home. There is even a local spring that is said to have first bubbled up after his death and continues to flow to this day, evidence of the (good) dragon spirit they believe was very strong in him. By contrast, he is reported to have had an evil brother who was a cannibal and threat to the village because of his (evil) wolf spirit. After listening to George tell us the story of these ancestors, it was evident that their “presence” in the village is still being felt to this day. George in front of his “Robin Hood” ancestor’s home (photo courtesy of Jupiter). In some ways, life in this village seems picturesque and idyllic. On the other hand, the remoteness and harshness of the land and weather make these people very tough and resilient. At the end of the day, we were thankful for the warmth and friendliness of George’s village and neighbors, and the comfort of our own bed back home! Hand-made noodles with beef…one of my favorites! Remember that line “Life is just a bowl of cherries”? Well, I beg to differ. Living in China has taught me that “Life is really a bowl of Noodles”! This is the second blog in what may become a mini-series that shares a few thoughts re: the question “What is it like living in China?” This time, I thought I’d share a few Things I Really Like and a few Things I Find Different. Yes, I’ve heard from some of you that these entries may seem a bit random…but that’s exactly what living cross-culturally is like much of the time. Different experiences seem to come at you from all angles…unexpectedly! You may also notice a lot of these entries have to do with food…what can I say?! Big, slippery, spongy rice noodles with pork…another favorite! Chinese noodle shop owner getting my order ready…yum! College cafeteria noodles (wheat or rice) with something like pork for less than $1.00! Rice noodles at the University cafeteria…not the very best, but very convenient! Simpler, slower pace of life – Adequate advance notice (invitation) for getting together with friends is “now”! Yes, I love Chinese food, but sometimes enjoying the Colonel’s Original Recipe without lots of bones in the chicken is a real treat! Cutting my wife’s hair (for the first time after 28 years of marriage). Now, that’s different! (She has curly, fine hair, but the local hairstylists specialize in cutting extremely straight, thick hair…not to mention the language barrier.) Good news is it turned out just fine. Oh, there is one other thing that is a bit different here: No “live” coverage of the 2016 Presidential Primaries! What is it like living in China? Dried (whole) fish and other special treats at the local Walmart. We get this question periodically and I thought it might be fun to share just a few (Top 10) items that have been on my mind the last few weeks. It’s been just over 6 months since my last blog posting, so it seems about time to post an entry. Language learning has been my primary focus for the past several months (in addition to soaking up culture) so things have been quiet on the blogging front. Do you ever find yourself struggling to keep track of different currencies when transferring and tracking funds between various accounts (one in US dollars, another in Hong Kong dollars, and a third in Chinese Yuan)? Me too. Do you occasionally find yourself in the shower, ready to rinse off the soap, when the water supply is cut off…without warning…without explanation…with no real certainty when the water supply will return? Yeah, me too. Do you ever find yourself at Walmart thinking “Hmmm, I feel like I really want a whole dried fish, whole dried squid, whole dried eel…!” Me either. Do you ever wish you could just drop your toilet paper in the toilet bowl (rather than in the waste basket) and flush? Yep, me too. D.) ride the scooter (and then walk). When the weather is bad, we typically opt for the bus. Do you ever dream about what it might be like to have unlimited access to the Internet? Even with our relatively modest (low) bandwidth (and a very good VPN), the idea of being able to freely visit sites that you select is virtually impossible most days (and nights). Some call it the “Great Firewall” effect. I call it the new “normal”! Do you ever find yourself without any personal space at all (on all 4 sides) and you’re not even uncomfortable about that anymore? That’s a big YES for me (remember, one of our family vehicles is the local city bus!). Do you ever find the temperature inside your home below 50F and you just want to reach for the thermostat and turn on the heat…but there is no thermostat…and there is no heat? That’s a daily experience for us in Dec, Jan and Feb.
Do you ever find yourself snacking on sunflower seeds with friends thinking “Wow, this is so simple and such a wonderful way to get to know people in a more relaxed setting than our normal busy schedules.” I love it when this happens! It’s always a special experience when we visit local friends’ homes and even when waiting for the food at some restaurants. Do you ever ask yourself “What am I doing here?!”? (You might fill in the blank with your current “location”, your current “job”, a particular “relationship”, your “house”…or whatever situation you may find stressful or difficult or puzzling). On the worst of days, do you say to yourself: “This has got to be one of the craziest things I’ve ever done.”? Then…the very same day, do you realize how thankful you are to have the incredibly rare privilege of disconnecting from the busy-ness, comfort and convenience of life to learn a new language and culture along with all the sights, sounds, tastes, smells and wonderful people that are a natural part of that process? I must admit I’ve taken a ride on this emotional rollercoaster in China…at least once or twice! Others tell me it is a normal part of living cross-culturally. How far is it to your nearest Starbucks? What do you typically pay for your favorite drink at Starbucks? There is an 8-9 hour “night train” option, but we’ll ignore that choice for now! So, total time to Starbucks: 7.5 hours! But, to avoid an overnight hotel bill, I should probably return home, so that puts the round trip at 15 hours…minimum! 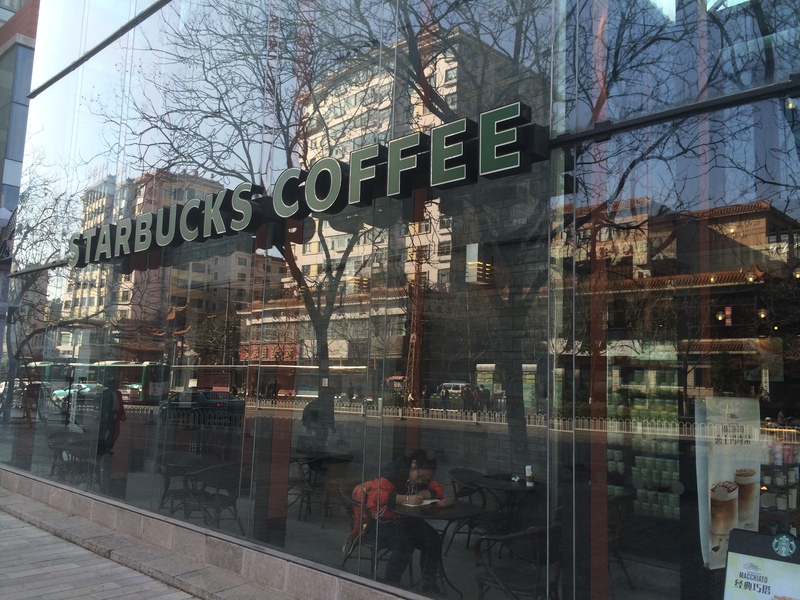 Since I still need to return home after visiting Starbucks, total cost: 452 RMB ($74 USD). Including a Tall Americano, my cost is just over $75 USD for a single cup of coffee. Does that sound a bit different than your normal experience? Welcome to life in remote SW China. 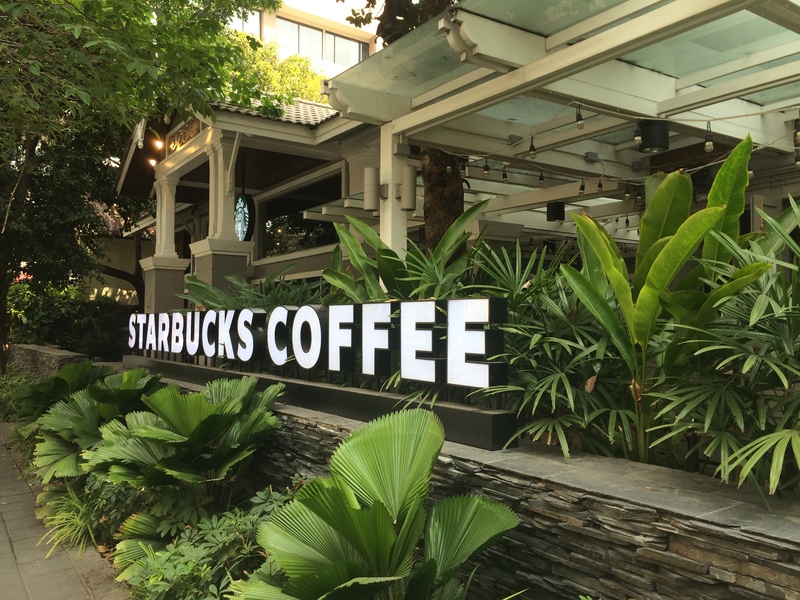 Now that you know why it could easily be 5 months before my next Starbucks Americano, I hope you will enjoy your next trip to Starbucks just a little bit more! Copyright © Kevin Beaty, YUNEV and “Feet on the Ground…”, 2015. All rights reserved. Pecan Pie – A New Global Sourcing Challenge?! 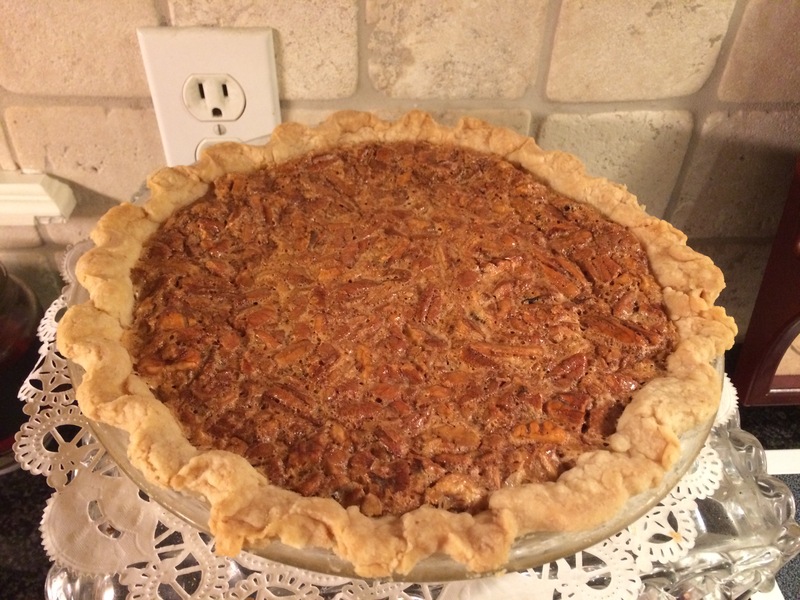 The actual Pecan Pie I will miss tomorrow (at my parents’ home in Tyler, Texas) Photo used with permission from K. Anderson. What’s your favorite Thanksgiving dessert? One of my personal favorites is Pecan Pie – Texas style. However, as we learned from our language helper last night, it might be a long time before we get Pecan Pie in China. Turns out her dictionary (with tens of thousands of Chinese words) did not even have a word for “pecan”. Our electronic dictionary also failed to find a Chinese word for “pecan”. So, easy access to pecan pie does not look promising in the near future. Naturally, our response to this sourcing challenge was to go with a dual-source strategy which worked out beautifully. 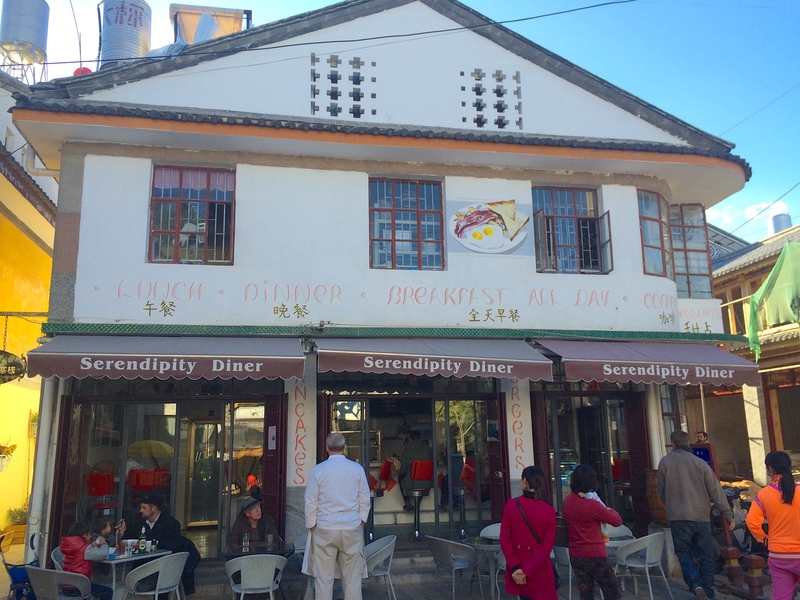 In a rare moment of cultural adaptability and flexibility, we enjoyed both apple pie and pumpkin pie as a fitting end to a delicious traditional Thanksgiving Dinner today at the Serendipity Diner (Dali’s local “New York style diner”). As often happens here, things change. Since the original “pecan” post was published (above), a couple of things happened. 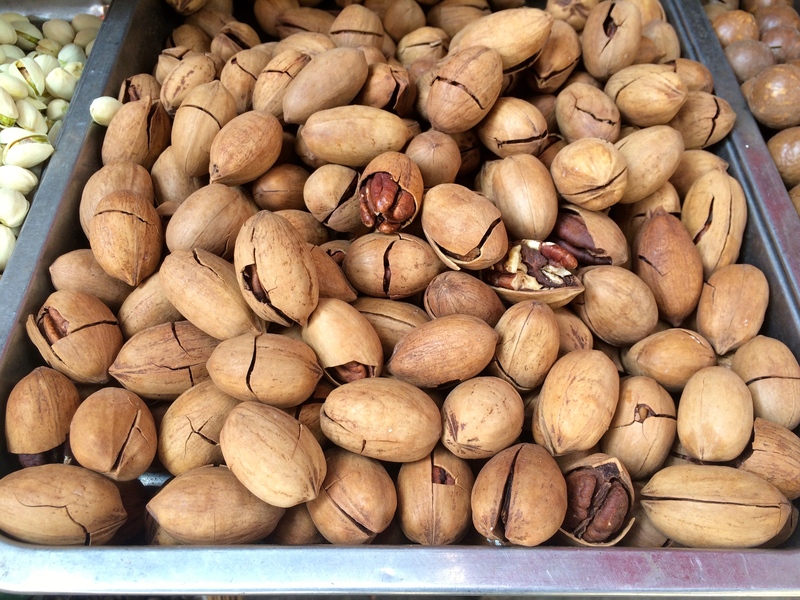 First, we began to notice “pecans” in the marketplace where they had not existed before (despite the fact that the closest Chinese word for “pecans” actually means “walnut”). In the interest of full disclosure, I should probably mention that these local “pecans” do have “Chinese characteristics“…meaning that the shell is typically already cracked (not shelled) and the meat itself has a sweet, buttery taste. They are very nice…but different. Then, a shipment of pecans arrived in a special package from Texas…what I would call the “real thing“! So, our logistics crisis has been solved for now. A fun reminder that it is always a tricky business to report on circumstances here in Yunnan, as they can often be quite different elsewhere in China and are subject to change here in Yunnan and everywhere else in China! Have you ever had fresh, hand-made noodles? Have you ever seen them being made?! After all, what would a proper blog be without a post on food? I hope you enjoyed this quick foodie experience…I’m sure there will be more to come! © Kevin Beaty, YUNEV and “Feet on the Ground…”, 2014-2015. All rights reserved.